How accurate are 'due dates'? When Penelope Chaney met up with her friend, Eleanor Marshall, she had good news to share - she was pregnant. But Eleanor also had good news... she was pregnant too. And amazingly, both had been given the same predicted delivery date - 4 April. So what are the chances of both giving birth on the same day? In the UK, where Chaney and Marshall live, a woman's estimated date of delivery is first calculated by using the date of her last period and adding 280 days, or 40 weeks. That is followed by an ultrasound scan where another estimate is made, based on the size of the foetus. If the two "due dates" differ by a week or more, the scan is taken as the more accurate measure. It's the same in most developed countries. But data from the Perinatal Institute, a non-profit organisation, shows that an estimated date of delivery is rarely accurate - in fact, a baby is born on its predicted due date just 4% of the time. The figure is higher when premature births and pregnancies with complications are not included, but only marginally (4.4%). While it may be helpful for parents to get an idea of when their child will arrive, the main purpose of the due date is to "define a metric for the care" of the mother during pregnancy, says Prof Jason Gardosi of the Perinatal Institute. "So, for example, to interpret early pregnancy blood tests for the risk for example of congenital anomalies, it's important to know how far gone the pregnancy is." The advice to the expectant mother, he says, is that the baby is likely to come any time between 37 weeks (259 days) and 42 weeks (294 days), a period referred to as "term", when the baby has reached full maturity, Gardosi says. 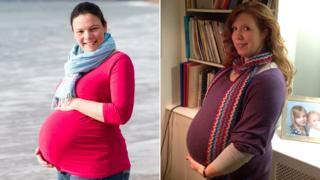 For women like Penelope and Eleanor, whose pregnancies are straightforward and low risk, 60% of babies are born within a week either side of the estimated date of delivery. More than 90% are born two weeks either side of the predicted date. But, as noted above, only 4% (or 4.4%, ignoring pregnancies with complications etc) are born on the predicted date itself - in other words, the chance of this happening is less than one in 20. What, then, are the chances of Penelope's and Eleanor's babies both being born on 4 April? Only 4.4% of 4.4%, or 0.2%. That's a probability of one in 500. The chance that their children will be born on the same day - any day, not necessarily 4 April - is higher. It's about one in 30. Gardosi says the statistics reveal an important message for pregnant women. The phrase "due date" is misleading. That makes it sound too accurate, he says - it should really be called an "estimated date". "Many mothers are unnecessarily anxious or impatient if there's too much reliance on the expected date of delivery," Gardosi says. "We really need to explain to them that this is just a date which helps us to determine the other milestones in pregnancy."